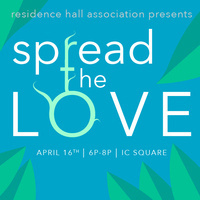 "Spread the Love" gives students an opportunity to spread love with the IC community in a variety of different ways, from sharing passions with others to giving back to the campus. This is an event in which student organizations will be tabling, running an activity, performing or showing love in whichever way they feel is best! Individuals who would like to request accessibility accommodations should contact ithacacollegerha@gmail.com. We ask that requests be made as soon as possible to ensure they can be met.